Back in 1978, I ran into Norbert Peshlakai, a young silversmith whose work caught my eye. I was so impressed with his jewelry making skills that the following year, I mounted a single artist show of Norbert’s work in my Chicago gallery. While he was in Chicago, I took Norbert on a little tour of local architecture and outdoor public sculpture. He was fascinated by the massive Picasso sculpture in Chicago’s Loop, and that sculpture continues to influence his jewelry design to this day. Norbert has commented “I see designs everywhere I look” which is quite a fitting remark for an artist who so skillfully captures these designs and uses them to create something that is uniquely his own. Norbert Peshlakai grew up in a traditional Navajo family in historic Crystal, New Mexico, yet his work is far from traditional. As you will see, his pins, bracelets, buckles, and silver bowls are all miniature pictorial displays, often with a playful theme. Imagine a pin that is a dog’s head and neck in profile from which dangles a tiny silver Timex clock. This is what Norbert calls his “Watch Dog pin”! I'm admiring the whimsical "Watch Dog Pin" that Norbert is wearing. Thirty years after my first show of his work, this intensely creative artist continues to depict a striking range of pictorial images in silver. His designs are always surprising and can never be confused with the work of any other artist. I’ve assembled quite a wide assortment of Norbert’s jewelry here, and I hope you enjoy these fine pieces. Also, if you are going to be in Santa Fe during the 2010 Indian Market, I will be opening a Norbert Peshlakai art show beginning Wednesday, August 18 at the Eldorado Hotel. Norbert may be there, and we'd love to see you as well. Click here in order to watch a video of Norbert Peshlakai describing our years of working together. 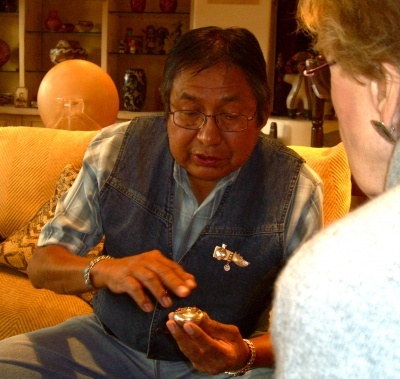 Norbert Peshlakai is describing the design elements behind his wonderful turtle bowl.